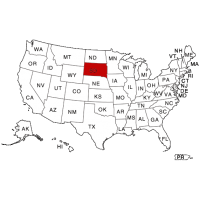 South Dakota is a very sensitive state for employers that are screening job candidates. They provide very limited data to the national database, therefore it is essential that you work with a background screening provider that knows the ins and outs of comprehensive record retrieval. To ensure you are obtaining an accurate criminal history in South Dakota, you must go directly to the county courts. Intelifi offers County Criminal Reports, and we send court researchers out to every county on a daily basis to perform record checks. Combining this with our National Criminal Report will make sure that you leave no stone unturned, and that your job candidates are being thoroughly screened before you proceed with an offer of employment. South Dakota criminal background checks will show Felony and Misdemeanor convictions, which range from serious offenses such as Bank Robbery, to less severe crimes such as Simple Assault.